FOLLOWING is our adventures and observations of “Rajahs, Riches & Rainforests”of the Orion Expedition Cruises tour of Borneo, Kota Kinabalu, Sabah, Malaysia, Borneo to Singapore. 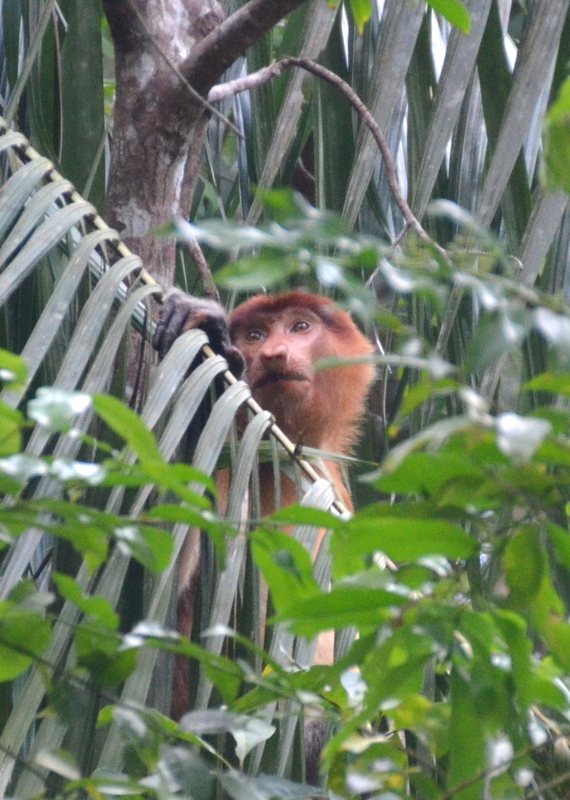 · Seeing our first Proboscis Monkeys, with the long protruding nose, in the Klias Wetlands in Sabah, Malaysia, on the island of Borneo, and photographing the reddish-brown-gray tree-living monkeys in a mangrove tree forest while rocking back and forth from a small boat. Almost impossible. 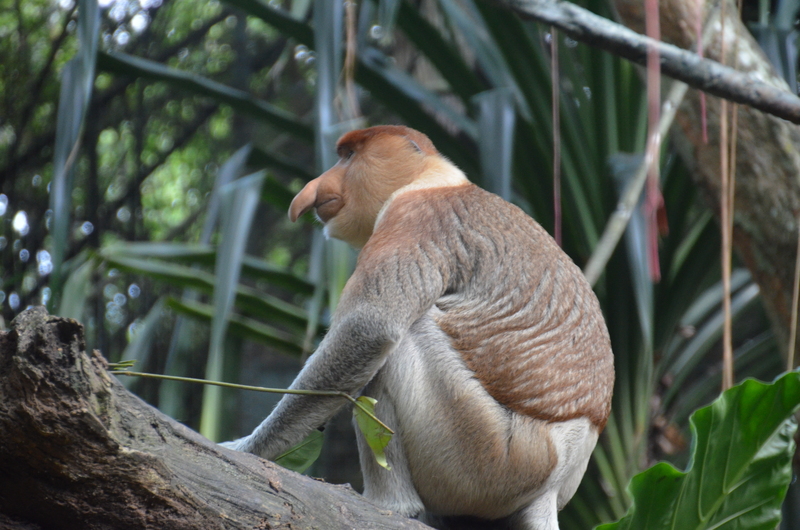 · Learning that the Proboscis Monkey is endemic only to Borneo and that the male’s up to 7-inch long nose is thought to attract females and to act as a resounding chamber to amplify their warning calls. And when the male becomes agitated, the nose swells with blood, making the warning calls even louder and more intense. · Getting our first leg of a 3- leg flight to Kota Kinabalu, Sabah, Malaysia on the island of Borneo aborted by United Airlines due to cabin pressure-air conditioning problems, only to have our entire route changed on an emergency basis and making it to Borneo thanks to the 8-hour non-stop performance by our Nexion, Inc. travel agent, Maureen Taylor, and Nancy, a United Airlines supervisor. Priceless. · Watching our first orangutans at Semenggoh Rehabilitation Center in Kuching, Sarawak, Malaysia on the island of Borneo, suddenly come out of the forest and give us an aerial best show on earth when the keeper puts bananas on the eating platform and called the orangutans to come. Priceless. · Being put in first class from San Francisco to Hong Kong by paying mileage points for the United Airlines flight mechanical problem and then going coach to Kota Kinabalu, Sabah, Malaysia, Borneo and getting 3 seats together, therefore getting to sleep most of the flight. Unbelievable. · Seeing the 1000+ year old water village, Kampong Ayer in Bandar Seri Begawan, Brunei Darussalem, which has 30,000 residents in houses on stilts and stretches 8 KM along the Brunei River. The well preserved national heritage site, called the Venice of the East, is the largest of its kind in the world and is self-contained with schools, police stations, clinics, fire brigade and mosques. A cluster of many villages connected by a web of walkways and bridges, Kampong Ayer has many village leaders which started the Sultanate’s civilization. 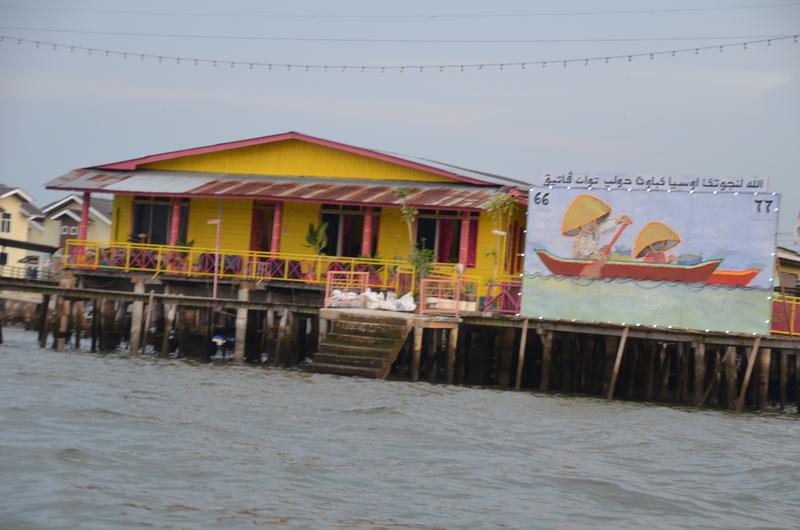 Kampong Ayer Village on stilts in Brunei. · Getting outstanding hotels in Hong Kong and Kota Kinabalu, Sabah, Malaysia at the last minute and getting the last room available in the Hong Kong airport hotel on our way to Borneo. · Learning that lowland forest in Borneo is dominated by one family of trees called dipterocamps and that one single hectare of dipterocamp forest may have over 200 species of trees. · Learning that Bako National Park on the coast in Sarawak, Malaysia, on the island of Borneo is a Heath Forest which has acidic sandy soil that lacks nutrients, and therefore, has the world’s greatest diversity of pitcher plants that eat insects trapped in chambers full of enzyme-rich fluids. · Enjoying the Hong Kong and Kota Kinabalu hotel’s Business Club Rooms with fabulous breakfasts and cocktail hours. 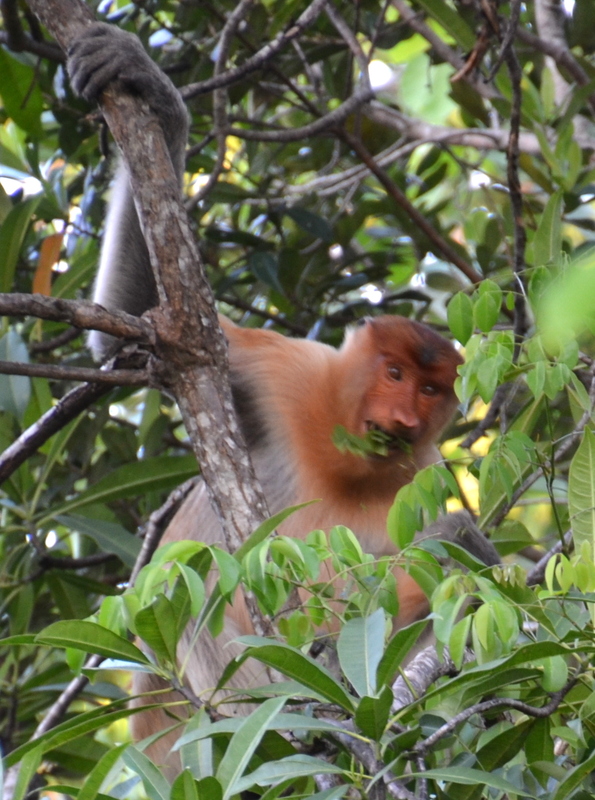 · Seeing and photographing Proboscis Monkeys and birds in Simalajau National Park in Sarawak, Malaysia on the island of Borneo, while rocking back and forth in a small boat on the waters of Sungai Similajau. Unbelievable. · Trying to find one lost luggage that did not arrive with us in Hong Kong and alerting everyone including our travel agent, Maureen Taylor of Houston, who immediately began working within the United Airlines system again. · Seeing Borneo’s Bearded Pig in Bako National Park and being surprised at how friendly and skinny they are and how long their beard is. · Meeting an English speaking couple in the Hyatt Club in Kota Kinabalu, Sabah, Malaysia on the island of Borneo, only to find out they were from Sydney, Australia and that wife, Lynette Silver, was a guest speaker on our first cruise and an expert on WWII in the Pacific and Sandakan Death March. · Learning that Hornbills play an extremely important ecological role by traveling great distances and dispersing seeds of rainforest fruits that they eat. But they are threatened due to the destruction of the forest for wood and palm oil. · Learning that the Sultan of Brunei Darussalem (means Abode of Peace) gives each person in his kingdom $1000 every month to live and that education and medical expenses are free to all. · Watching everything come to a screeching halt when Big Daddy Ritchie, the dominant male orangutan, arrived at the feeding platform in Semenggoh Rehab Center. Both tourists and orangutans got out of his way. Priceless. · Learning that Brunei Darussalem does not have any precious stones, it just has precious liquid. · Learning that during Ramadan, His Majesty of Brunei Darussalem gives the male and female winner of the Al Quran reading competition $2000 per month each for life. People of all ages compete against each other reading the Quran. · Watching another “greatest show on earth” as the other orangutans waited at a safe distance for their snack while Ritchie stuffed in his bananas snack at Semenggoh. Big Daddy Ritchie, the dominant male at Semenggoh Rehab Center. Learning that at the end of Ramadan, Hari Raya is then celebrated for several days where families visit each other, go to the mosque and give money to children and that everyone in a city celebrates it, no matter what their religion. 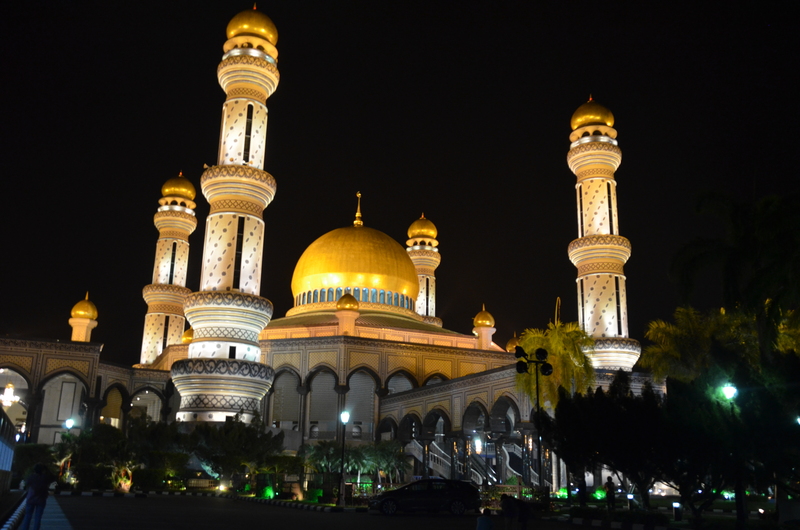 · Learning that there are no taxis in Brunei Darussalem because everyone has several cars. · Learning that the price of one liter of gas in Brunei Darussalem is 53 cents as has been for over 20 years. · Learning that His Majesty of Brunei Darussalem has a 2,000 room palace on 300 acres that has everything in it one could ever want. · Learning that His Majesty of Brunei Darussalem has an emphasis on women and children because he wants to increase the population and therefore, gives women special attention at hospitals and other services. · Finally getting our lost luggage one week later and having to pay $185 USD for it and really enjoying the Borneo experience now all because of one lady, Maureen Taylor, our A+++++ travel agent, who single handedly, put this trip together and then saved it for us to enjoy our dream trip of a lifetime. 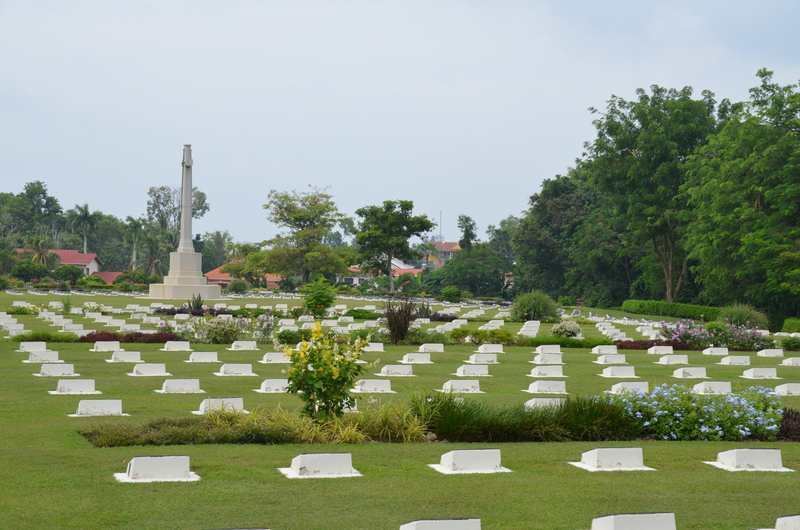 · Going to the Commonwealth War Cemetery in Lubuan, Sabah, Malaysia on the island of Borneo, where many of the Sandakan Death March soldiers are buried and hearing some of their individual stories from Lynette Silver, historian for the cruise. · Learning that only France has as many Unknown Soldier’s graves from WWII as Lubuan, Sabah, Malaysia on the island of Borneo. · Going to Semenggoh Rehabilitation Center near Kuching, Sarawak, Malaysia on the island of Borneo and getting the “greatest show on earth” from 7 orangutans living in semi-wild existence in the forest while having a morning snack of bananas. Absolutely priceless. · Going to Matang Rehabilitation Center near Kuching, Sarawak, Malaysia on the island of Borneo, and helping the Center’s keepers prepare a snack of chunked fruits and vegetables, hull and all, in a plastic liter bottle, and topping the final creation with honey or other favorite flavorings, and giving it to awaiting orangutans. The strong orangutans would then bite and tear their bottle open and munch every morsel non-stop. Making snacks for the orangutans. · Recapping each day with amazing photos of activities by the Orion Expedition team. Wonderful. · Learning from Lynette Silver of Sydney, Australia, about those soldiers involved in the Sandakan Death March during WWII by the Japanese and how she uncovered the horrible conditions they endured through years of research and was able, therefore, to give them some proper recognition, burial and honors. · Painting Matang Rehab Center’s 15-foot tall concrete wall green wearing rubber boots and gloves in the confiscated and orphaned monkeys and ape’s training yard in 100+degree heat, midday sun and 95% humidity without passing out. Amazing. · Seeing modern cities along the northern and western coast of the island of Borneo. Unbelievable. · Seeing Brunei Darussalem city and His Majesty’s gorgeous palace. 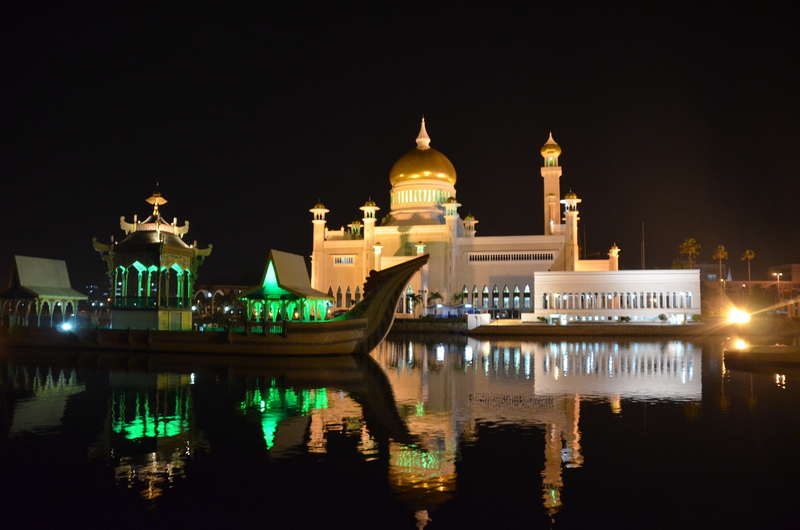 · Seeing 2 mosques in Brunei Darussalem, Sultan Omar Ali Saifiddien Mosque, which has 29 of each thing because he is the 29th sultan of Brunei Darussalem and it is his mosque, and Jame Asr Hassanil Bolkiah Mosque. Both are absolutely perfect and gorgeous and we viewed them in the day and in the night. · Learning that Tanjung Datu National Park, one of the smallest and most beautiful in Sarawak, Malaysia on the island of Borneo, has near-pristine beaches on which endangered Green Turtles and Olive Ridley Turtles lay their eggs. · Having a tour guide in Brunei Darussalem that was the happiest of all tour guides ever encountered anywhere in the world. · Seeing the beautiful coral reefs at Natuna Seta and Anambas Lintang, 2 islands in Riau Islands Province, between Borneo and Singapore in the South China Sea, were absolutely beautiful. · Getting a souvenir from Brunei Darussalem in the shape of a crystal octagon containing a teaspoon of precious Brunei oil. · Seeing His Majesty’s of Brunei Darussalem gift collection from all the Heads of State of the countries of the world. · Visiting the Singapore Zoo and photographing orangutans and proboscis monkeys, only to end the fabulous day at the Singapore Bird Park and seeing incredible birds and orchids. So much fun. · Touring His Majesty’s 2 museums in Brunei Darussalem and seeing his priceless collections. 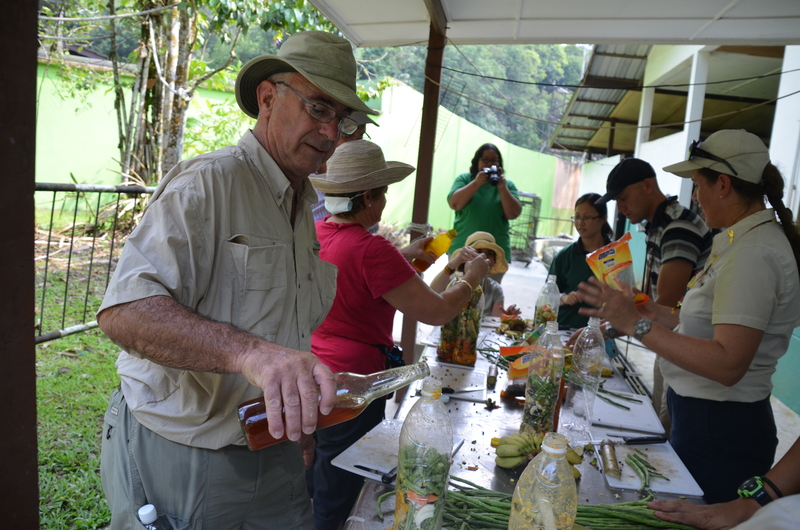 · Learning that Brunei Darussalem has no precious stones, only precious liquid. · Learning that Brunei Darussalem has about 50-60 years of oil reserve left. · Learning that “orang utan” means “man of the forest” . · Learning that orangutans are 96.8% like humans, are large and powerful solitary apes, human-like in their expressions, can “speak” sign language, are the only ape to live in the canopy of forests, have opposable toes on their feet effectively giving them 4 hands, have highly mobile hip joints, can walk upright, can lie, have a very slow breeding rate every 8 years, have babies that depend on the Mother until another baby is born, eat mainly fruits and wild figs, mangoes and rambutans and have the strength of 4 men combined. 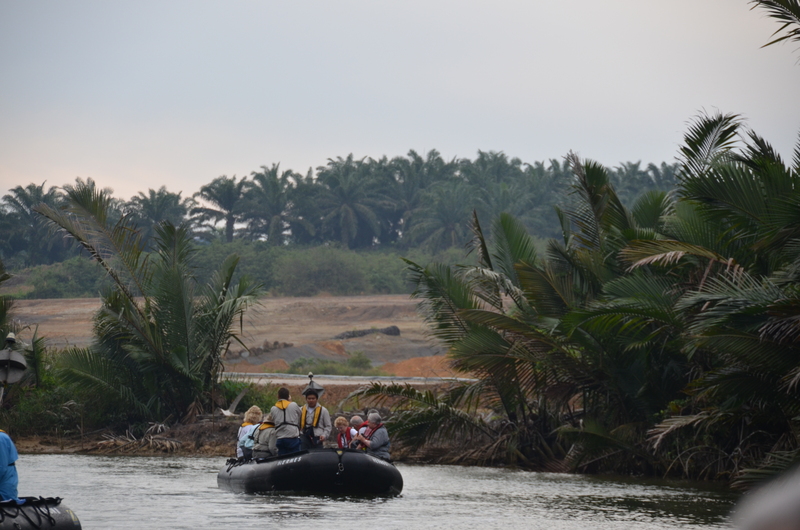 · Seeing the first orangutan come in from the semi-wild in the Semenggoh (see meng go) Rehabilitation Center to eat a snack supplement. Priceless. 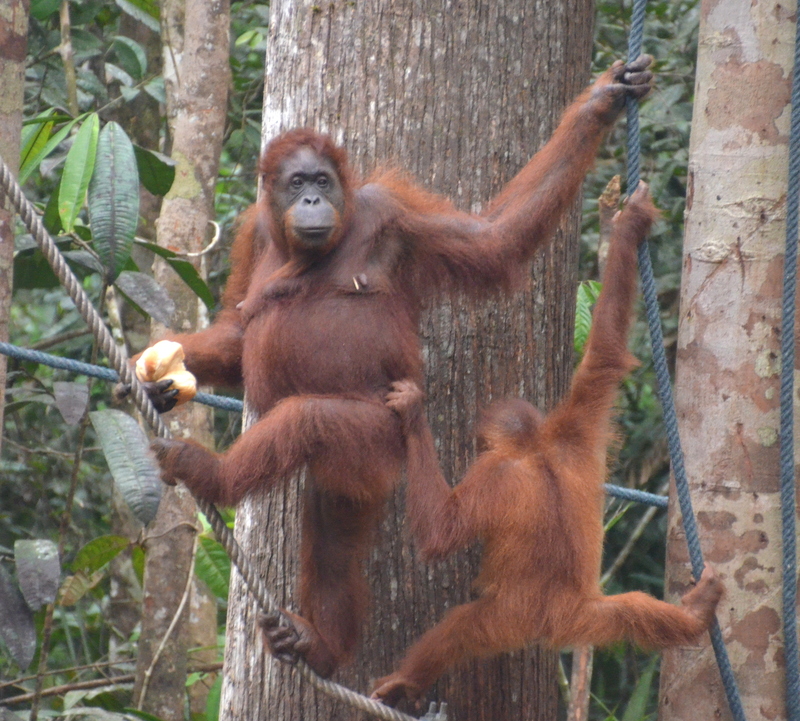 · Learning that Hot Mamma and Big Daddy Ritchie, dominant female and male at the Semenggoh Rehabilitation Center, love Coca-Cola and back packs because they think back packs have food in them, and therefore, both must be hidden from their view. · Learning that Ritchie hates guns and if he sees an umbrella under the arm, walking stick or a telephoto lens he immediately thinks it is a gun and can attack or can get so mad he might destroy things at the Rehab Center, after the tourists leave. · Learning that Ritchie does not like for the visitor to look directly in his eyes, to hear crying babies or any noises as he might get very mad, only to have a child throw a crying fit when Ritchie was stuffing in the bananas but he did not get upset then. Many times after the tourists leave, Ritchie does destroy property like the time he tore up a Porta-Potty and broke down a concrete telephone pole. · Learning that Hot Mamma gets real nice when her photo is taken even though she might be mad and mean right before it, but that she and Ritchie do not like the camera flash to go off. · Learning that every time there is a problem at Semenggoh Rehab Center, Hot Mamma is in the center of it or cause of it. Hot Mamma and her baby at Semenggoh. · Learning that if an orangutan comes toward you at Semenggoh, RUN in the opposite direction immediately to open spaces because if you run to an enclosed area, they will catch you because they are 96.4% human and know the same tactics as humans. 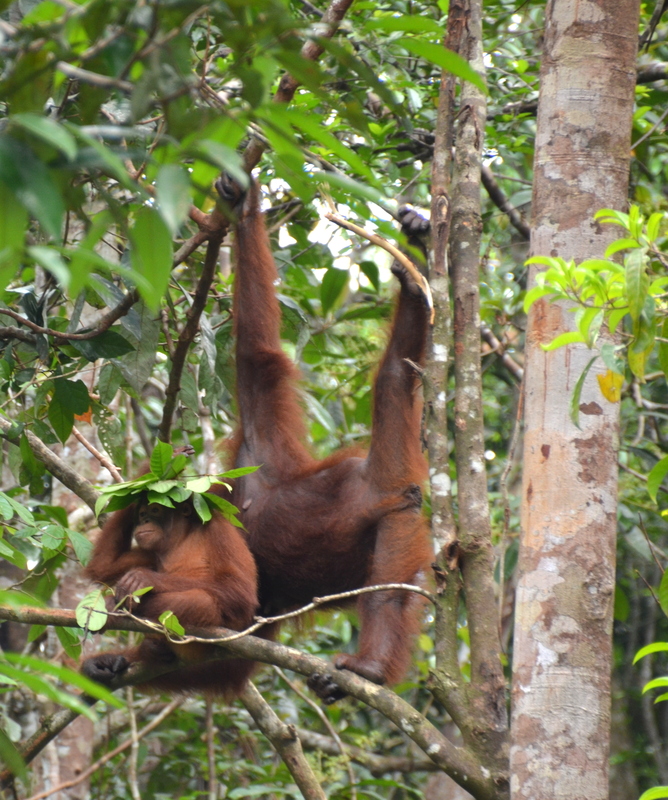 · Learning that the forest around Semenggoh Rehab Center can only support 6-8 orangutans, explaining the need to feed extra food supplements 2 times a day because there are 26 orangutans that are being rehabilitated for return to the wild. · Learning that Semenggoh Rehab Center total orangutan count has now increased to 26 orangutans because an infant was just born the day before we arrived. 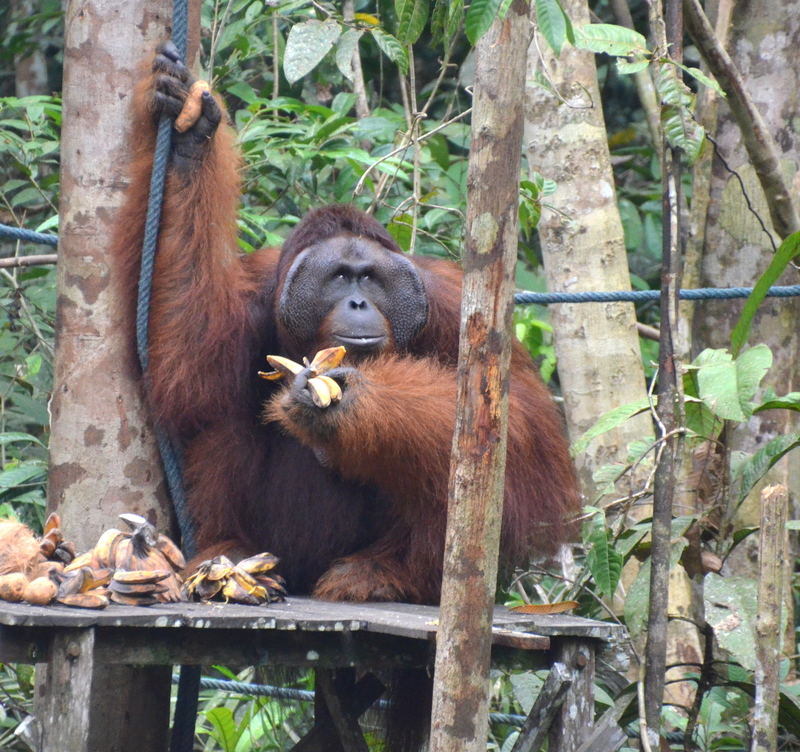 · Learning that Ritchie is the father of babies born at Semenggoh since he has been the dominant male of the center for 40 years because he runs off other male orangutans and kills any baby that is not his. · Learning that orangutans can live 90-100 years and when a male becomes the dominant male, he suddenly develops huge cheek flaps that resemble the blinders on a horse. Plus, his hair grows long, is heavy and strong and develops a skin pocket from this throat to his chest for making loud calls and noises that can he heard a half mile away. 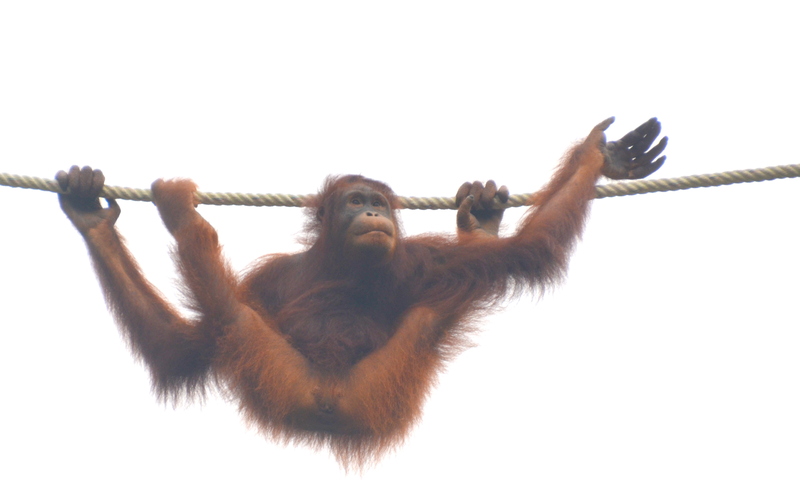 · Learning that Ritchie, Hot Mamma and the other orangutans are given privacy about half-way through each feeding so they can eat their snacks in peace and quiet with no visitors watching at Semenggoh. · Learning the orangutans make a nest in the fork of a tree using leaves and soft branches every few days for sleeping and napping, and that they move to a new nest every few days. · Watching a staff member at Semenggoh Rehab Center call the orangutans several times from the forest for their morning snack, only to suddenly have them show up, one by one. Absolutely AWESOME and breath taking. · Learning how to take photos of wildlife from Mick Fogg, of the Orion Expedition Cruises team. Very Helpful. · Going to Tanjung Datu National Park and walking the rainforest trail. Pristine rainforests cleared for palm oil plantations/developemnts. Learning that the pristine rainforests of Borneo are being destroyed daily to make way for palm oil plantations and developments, thereby eliminating orangutans and their wild habitat and projecting there will be no wild orangutans left within ten years in Borneo. me know howw you feel.